For the holidays, I asked my husband to get me an item from the Seattle Food Geek Gift Guide. I’ve been doing a great deal more cooking in the past months, so much that it has distracted me from other maker projects. At its best, cooking fulfills some of the same needs: learning something new, figuring out problems, discovering better ways to do things, and creating something beautiful. Best of all, it is useful! Make something delicious and your family is happy; and every night is an opportunity for a new “project”. Still, there are many excellent cooking blogs in the world, so I did not think there was a need for posts on that. However, the gift item my husband chose was the Sous Vide Supreme. And sous vide cooking is both new enough and geeky enough that I thought it might be of interest. I first learned of it in “Cooking for Geeks” by Jeff Potter. Basically, it is a precision temperature-controlled fluid bath. Foods are (generally) placed in a plastic bag, then the air is removed and the bag vacuum-sealed. The food bag is placed in the bath, and sits at the desired internal temperature for a long time. This is different than oven roasting where the cooking temperature is often hundreds of degrees higher than the desired final internal temperature. Thus roasting can often result in an overdone exterior and underdone interior. The high heat is required due to the inefficient heat transfer of air. But with the sous vide fluid the heat transfer is much faster. It is possible to get your fish or meat to the right temperature in a reasonable amount of time, depending on the thickness of the meat. The entire piece will be cooked evenly, and exact timing is usually not required; you can leave the food item in there quite a bit longer and it will not overcook. The classic item to start with is an egg, because being in a shell it doesn’t need the vacuum-sealed bag. As suggested in Jeff’s book, I put the egg in at 146F for 1 hour. 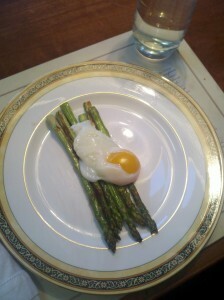 Near the end of the hour, I sauteed some asparagus. After that, I took the egg out and did the optional step of cracking the egg into a cup of very hot water (to set the whites more) then took it out immediately with a slotted spoon and put it over the asparagus. The egg was amazing. The yolk was like a custard, ever so slightly runny, and the whites were soft. The look of it was very unique too. It’s easy to play with the temperature to get the egg the way you like, and for slow-cooked eggs the results will be very consistent. Again, exact timing is not required. Here is a picture of the result. It is possible to cook eggs quickly as well; I’ve done them at 167F for 15 minutes the last few mornings, and since that is much higher than the desired internal temperature, precise timing becomes important. That said, the eggs are far more consistent this way than using boiling water or the microwave! Having had success with the egg, my next test was salmon. I had heard this was a classic sous vide dish. I bought 3 8oz filets, and put 3 tablespoons of olive oil in small cups into the freezer briefly to set them into a gel. 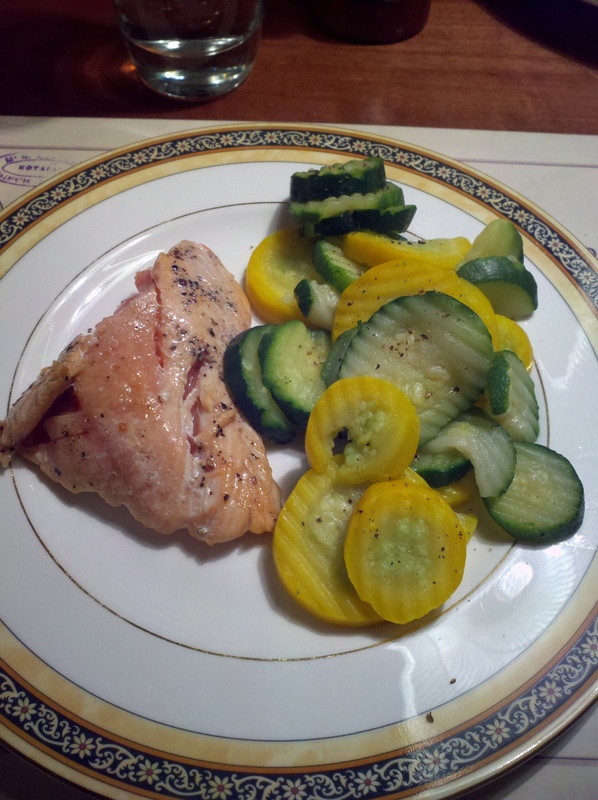 I then bagged each salmon with the olive oil gel and cooked it for 40 minutes at 122F. The results were outstanding. I’ve never had such good fish, and the edges were as moist as the interior. Coming out of the bag, it looked raw, which is normal for sous vide. I used a pan to sear each side for 30 seconds, then we all ate. Everyone loved it, especially the kids, who have begged me to make it again. Next up, chicken breasts. These are healthy and very filling, but let’s face it, they can be dry and boring as well. I’ve figured out some good recipes by now, but I always prefer the fattier dark meat. I tried out a butter poached chicken breast with fennel recipe. Once again, the meat was extremely moist. But the sauce was not interesting enough. Chicken breasts as an entrée still require a strong flavor, whether a sauce, marinade, or dry rub. I had better success with cooking a large batch of chicken breasts for my lunch salads. I’ve avoided making these in bulk in the oven because it is too hard to guarantee uniformity, and the last thing I wanted was a large amount of dry or underdone chicken on hand. I rely on leftovers from dinner instead which is a bit hit or miss. In the sous vide making the breasts was very easy, throw the bag in for a few hours and that was it — and the results were excellent. The concept of cooking decoupled from time (mostly) is a fascinating one. I usually focus on cooking the protein perfectly and keep the side as simple as possible because the timing issues are such a pain. But the sous vide frees me up to make a more interesting side dish. 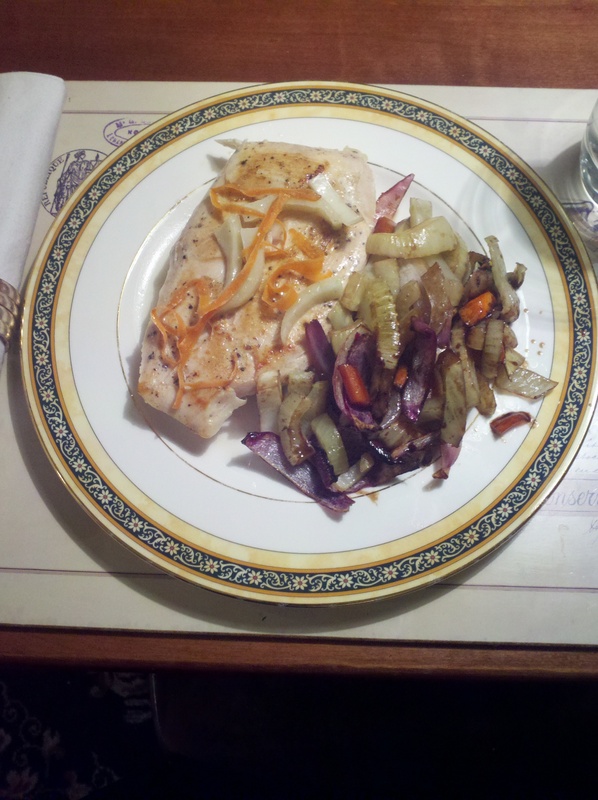 The butter poached chicken may have been a bit bland, but the roasted fennel, carrot, and onion side I served with it was a hit. And I would never had made that under normal circumstances. One can go a lot further than this. Make your dish ahead of time, keep it in the vacuum sealed bag, then chill or freeze it. Just warm it up again when you are ready to eat. Or, cook multiple items at the same time. If the higher temperature ones go in first, they can stay in while the lower temperature ones are there too — they won’t overcook. And everything is all warm and ready to go when you want to eat. No doubt this utility is why the sous vide became popular in the restaurant world. This situation has some similarities to a slow cooker, where you also have the luxury of putting something together and letting it sit for hours. In the slow cooker you must use a sauce, the meat will shrink, there are some practical limitations in terms of how long it can stay in, and the cook/chill option is not generally available. Nevertheless the slow cooker is a wonderful tool. Because sous vide is fairly new to home chefs, creativity is required in figuring out how to apply recipes to it. One idea that occurred to me for tonight was mashed potatoes. To get the richest flavor from the potatoes, it’s best to boil them with the skins on. But you then have the problem of getting the skins off afterwards without letting the potatoes cool down too much. And generally, it all must be precisely timed: if your guests aren’t there on time, you will be stuck with cold potatoes. For Thanksgiving, I found a make ahead recipe which got around the timing problem. The sous vide seemed to have the potential to solve both skin and timing. I peeled the potatoes, sealed them up, and put them in at 184F. When the rest of the meal — stout-braised beef short ribs — was ready, I mashed the potatoes with butter, milk, and sour cream. They were exactly the right consistency and, again, delicious. Bonus: I bagged some peeled, halved pears and cooked them along with the potatoes. When dinner was over I unsealed the poached pears and drizzled on some honey and blue cheese crumbles. A nice hot dessert, yum. Similar to a slow cooker, the sous vide will not brown the outside of the meat. Browning is desirable from an aesthetic and taste point of view, even if it is not the healthiest option. The easiest way to brown meat is to quickly pan sear the meat before or after cooking. The fun way, is to use a blow torch when the dish is completed! I’ve ordered a culinary blow torch, and am looking forward to trying it out. Finally, there are some neat things that can be done with a hot water bath. I suspect I could use this to make yogurt, or culture biological samples. I have some herbal tea which needs to steep for 10 minutes, but can’t be brought to a boil again after steeping. To keep the tea warm, just sit the mug in the sous vide. Etc. There are many more uses I’m sure, and I’m looking forward to exploring them.